NOTE: Biological treatment and control of Legionella and other potentially health-threatening bacteria is essential. Consult a competent water treatment expert or service company. Langelier Saturation Index 0.0 to 1.0 recommended; higher allowed if scale is controllable. Sulfides Greater than 1 ppm can be corrosive to copper alloys, iron, steel, and galvanized steel. See table below for limits with film fill. Ammonia 50 ppm maximum if copper alloys present; lower limits apply for film fill - see table. Chlorine / bromine 2 ppm free residual intermittently (shock), or 1 ppm continuously maximum. 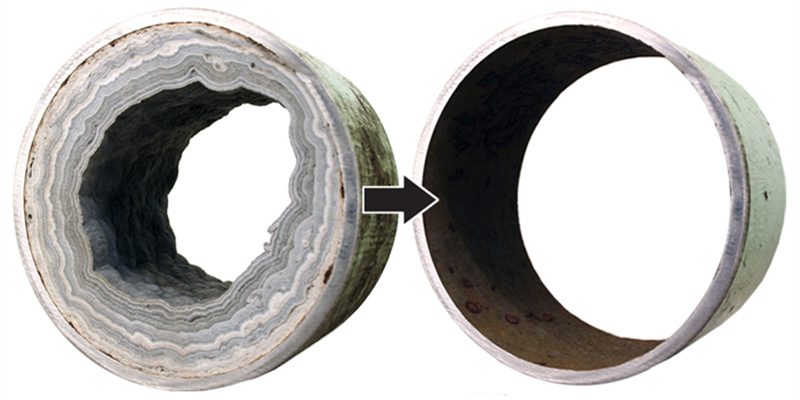 Excess can attack sealants, accelerate corrosion, increase drift, and embrittle PVC. Organic solvents These can attack plastics and promote bio-growth. Trace amounts may be acceptable, depending on the solvent. TDS Over 5000 ppm can affect thermal performance and be detrimental to wood in alternately wet/dry zones such as fan deck and louver face. Anions Chlorides 450 ppm as Cl- (300 for galvanized towers) upgrades are required for higher chloride levels. Bacteria counts listed below relate to maintaining fill thermal efficiency only. Biocidal treatment is required for all cooling tower installations. (see NOTE above). Note: Any amount of oil or grease is likely to adversely affect thermal performance. Sulfides and ammonia promote bacterial growth which can cause fill fouling; conformance to the limits above will assist in controlling bacteria to the recommended levels. Certain contaminants or treatment chemicals such as surfactants, glycols, biodispersants and antifoams may increase drift rate. When minimizing drift is vital, the circulating water shall have a surface tension of at least 65 dynes/cm and a total organic carbon (TOC) level below 50 ppm. Reclaim or re-use waters in particular may contain contaminants which increase drift rate either directly or by necessitating the use of treatment chemicals which increase drift rate. Avoid high efficiency fill (MC75) with water containing bacteria nutrients such as alcohols, nitrates, ammonia, fats, glycols, phosphates, black liquor, or TOC greater than 50 ppm. Clog-resistant fills may be considered for contaminated water, case by case. For all film fills, avoid fibrous, oily, greasy, fatty, or tarry contaminants, which can plug fill. In general, do not use film fill in Steel Plants, Pulp & Paper Mills, Food Processing Operations, or similar applications unless leaks and contamination by airborne or waterborne particulates, oil, or fibers are extremely unlikely. If film fill is used, biological-growth control must be stringent and diligent.